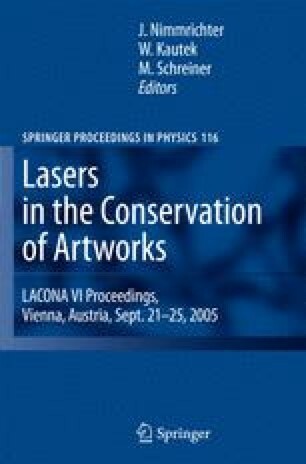 This chapter focuses on the use of Er:YAG laser cleaning technique for the removal of unwanted and/or degraded materials both from a large series of reference standards (overpainting, varnishes, patinas, and restoration materials) which simulate the layering of old paintings, and also examples from old paintings. A series of diagnostic controls (optical microscopy, SEM, FT-IR, GC–MS, and topographic techniques) were designed to study the effects of the laser radiation on the surface components, including morphological, optical, and chemical examination. The most significant results show that an effective thin-layer-removal of about 90% is obtained by submitting the painted surfaces to the laser exposure, while the rest of cleaning is rapidly accomplished in safety by applying mild solvents or aqueous methods. Consequently, possible interference with the original substrate can be noticeably minimized. No degradation compound induced by laser energy was formed. The laser cleaning procedure applied on an oil painting canvas “Morte di Adone” (seventeenth century), and on a panel tempera painting “San Nicola e San Giusto” of Domenico di Michelino (fifteenth century) shows that the surfaces cleaned by this system exhibit a morphology quite similar to that obtained by traditional cleaning methods.